Contract crews will be back out on Main Street near the intersection of Smith Street to repair a patch of asphalt that failed. Underground utility work was completed near this intersection in preparation for a new building on the corner, but after numerous days of wet weather the patched asphalt collapsed Friday and needs to be re-compacted and repaired. Look for flag crews and reduced lane travel at this intersection Monday. UPDATE! Contract crews have discovered an extremely old water line along Main Street. Rain on Monday and Tuesday delayed the work and now the discovery of this deteriorating line will delay the project completion until Friday afternoon. The section of Main Street near Smith Street will need to remain closed tonight and through Friday afternoon. A small section of Main Street will be closed to allow for an exciting new addition to Downtown Clayton. This work was originally scheduled for Mon, Feb. 11th, but due to rain has now been moved to Wednesday, Feb. 13th. Now an unexpected utility line issue will keep Main Street blocked just past the Smith Street intersection in front of the vacant corner property across from Clayton Pediatric Dentistry, through Friday afternoon. Detour signs will be set up at Smith and Lombard streets to direct traffic one block down to 2nd Street. Barricades will placed at Smith and Main. At the Lombard corner, local traffic and customers will be allowed to drive down to access the Main Street businesses such as Jewelry Design Studio & Repairs, Manning's restaurant, Jones Cafe, Rejoyce Gifts, Medlin Office Supply, Olde Town Supply, Inc., Chefella's Cafe & Event Planning, Kirby's Precision Cuts, First Federal Bank, Kristoff Law Offices, Lewis Brothers Tire & Alignment, Main St Community Garden, Michael’s Auto Service Centers, Inc., Wine on Main, or Clayton School of Creative Arts. We imagine that Main Street thru-traffic may miss the detour signage at Lombard and may end up having to do U-turns before the Smith Street closure. The exciting new addition that necessitates this temporary closure is a development that would add a three-story building to Main Street. The Stephenson building is 7,700-square-foot red-brick structure, with the first floor being home to offices and business. 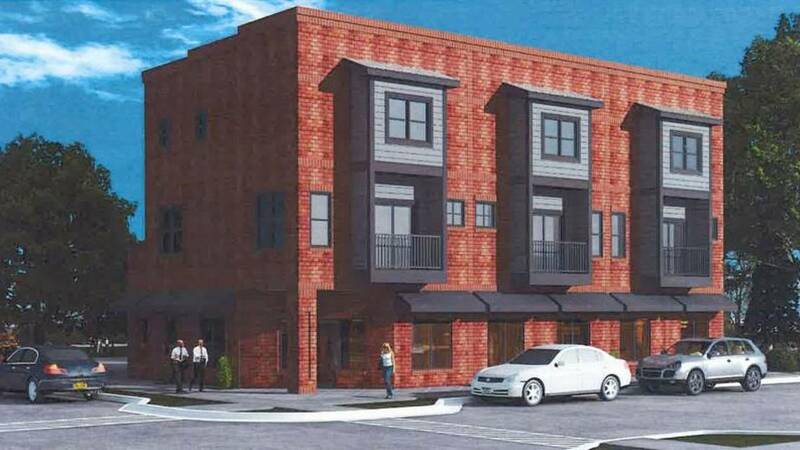 The rest of the building would allow a few more residents to call Downtown Clayton home, with plans for three two-story apartments on the second and third floors. Thank you for your patience as we try to safely complete this work and direct traffic to ensure the public can access these Downtown Clayton, NC businesses!